Are you serious about making money with your photography business? Then choose the industry's best workflow solution: Darkroom Software. View a Darkroom Demonstration (link will open a new window) Already own Darkroom? Check out Darkroom Support or Photobooth Support for Manuals, Video Tutorials and Frequently Asked Questions. If you would like to upgrade your Darkroom Software, you can purchase an upgrade below. This video will show you how to update your software key (dongle). 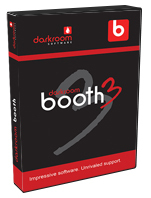 Darkroom Booth 3 Available Now! Darkroom Professional Version 9.2 completes your photography workflow by combining all of the elements of Version 9.1, plus many powerful new features. Upgrade your Darkroom Core 9.1 software to the latest version!!! Upgrade your Darkroom Pro 9.1 to the latest version! Remote Setup and Training for Darkroom - 1hr. 1 hour of remote setup and training for Express Digital Darkroom software.